Low-key photography is a genre of photography consisting of shooting dark-colored scenes, and emphasizing natural or artificial light only on specific areas in the frame. This photographic style is usually used to create a mysterious atmosphere, that only suggests various shapes, often graphic, letting the viewer experience the photograph through subjective interpretation and often implies painting objects or the human body with black non-toxic dyes or pigments. Renaissance and Baroque, represented by different painting styles including sfumato and chiaroscuro used by artists like Leonardo da Vinci and Rubens), tenebroso (it. dark, mysterious) used by artists such as Caravaggio, Rembrandt, Jusepe de Ribera among others, produced paintings in which black was predominant on the canvas and the light often come from only one source to achieve dramatic scenes. Edward Weston, Yousuf Karsh and Irving Penn are among the photographers experienced with the "black on black" technique. According to the Online Etymology Dictionary the term "low-key" appeared in 1895, a term that described something "low-keyed" (relating quiet sound or deep musical tone); according to the Random House Webster's Unabridged Dictionary the term appeared between 1890–1895; however, the earliest (known) use of the term dates back to 1830 in the Genius of Liberty. The "Rembrandt lighting" (or "Rembrandtian light") is a term correlated mostly with low-key portrait photography which uses a light source and a reflector, or two sources of light (a main and a very low intensity fill light). 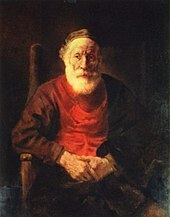 The term was named after the style of lighting the face in most of Rembrandt's self-portraits, but also in other works, such as the Portrait of an Old Man in Red (1652–1654), dominated by Tenebrism. Renaissance and Baroque painters have often used the sfumato, chiaroscuro and later the tenebroso painting modes not only to give a tridimensional impression in their paintings but also to achieve a dramatic atmosphere. After the decline in popularity of the Pictorialism movement, the new style of photographic Modernism came into vogue, and the public's interest shifted to more sharply focused images. Edward Steichen, Imogen Cunningham and Edward Weston were among the first photographers considered pioneers of low-key photography. Steichen's portrait of J. P. Morgan (1903), Pastoral – Moonlight (1907), published in Camera Work No. 20, Cunningham's Succulent (1920) and Weston's Pepper No. 30 (1930) are considered the earliest low-key photographs. On the other hand, chiaroscuro, another oil painting technique, uses strong tonal contrasts between light and dark to model three-dimensional forms, often to dramatic effect. The first use of light-dark three-dimensional shadows – known as "skiagraphia" or "shadow-painting" in Ancient Greece – is traditionally attributed to the Athenian painter of the fifth century BC, Apollodorus (in De Gloria Atheniensum, Plutarch). Leonardo da Vinci, through his Virgin of the Rocks (1483–1486, Louvre, Paris), influenced the use of chiaroscuro to create the illusion of depth; however, the term is most often associated with the works created in Mannerism and Baroque. In the Renaissance, the technique became essential to all "religious" painters who followed the visions of Bridget of Sweden, who claimed to have seen the light of Christ. In the paintings with religious scenes, the Renaissance artists reassigned this holy light as the predominant source of illumination, relying heavily on the chiaroscuro technique. This compositional approach has been extensively used in Tintoretto's Last Supper (1592–1594). If the religious chiaroscuro of the Renaissance served to create quiet and calm scenes, painters such as Caravaggio, Baglione, Veronese, and Georges de La Tour, had the tendency to use this style for a dramatic effect. In Baroque, painting relied heavily on the use of shadows for their dramatic effect. 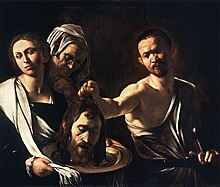 Caravaggio has accomplished the dramatic illumination to its greatest extent with his method called tenebrism – a technique that has spread to Europe under the name of caravaggism. The works of Adam Elsheimer's were a turning point between chiaroscuro and tenebrism. At first glance, a tenebrism painting could look very similar to the one using powerful chiaroscuro effects. However, there is a difference between the two styles: chiaroscuro is a shading technique used especially to give objects the illusion of volume, while tenebrism is a compositional technique that uses very dark shadows, in which some areas of the painting are preserved darkly (sometimes black), allowing only one or two areas of interest to be strongly illuminated; at the same time, the transition from light to dark is not gradual. The style was used for a purely dramatic effect (hence the term "dramatic illumination"), and there was no involvement in trying to create the illusion of three-dimensionality. This style has been the victim of many negative criticisms in the Baroque, critics accusing artists of using this method to "hide" the mistakes of the paintings. First, Caravaggio's art, which approached the new artistic style in the most radical way, was aimed. Like Caravaggio, Rembrandt as well was accused of hiding his defects in the shades' painting. Tenebrism gave the darkness a positive value, both iconic and symbolic, creating thus a new aesthetics. Darkness was equivalent to light, because it conditioned the glory and the majesty of the latter. The symbols of light and darkness were expressed in the works of Tintoretto, Caravaggio, Georges de La Tour and Rembrandt. In the photography of one of the most prominent portraitists, the Canadian Yousuf Karsh (1908–2002), the light only outlines the face; it may highlight it more or less intensely, but from an artistic point of view, light plays a secondary role in the scene along with the main subject. His portraits contain large areas of black, and the subject appears like a spot in that achromatic nothingness. Nothing competes with the areas of his subjects' faces being highlighted, which gives the portraits an almost mystical aura. Thus, in the portrait of Winston Churchill, which according to The Economist is the "most reproduced portrait in the history of photography" and has been described as one of the "most iconic portraits ever shot", only his face is highlighted, while his head is outlined by another, very low light source, coming from the back; in the portrait of Jean Sibelius, the light is reduced even more, with half of the face being in gloom; in Helen Keller with Polly Thompson, both subjects are dressed in black and the background is also entirely black, so the photograph gives an impression of detachment, dissolution; Jasper Johns seems to emerge from a black ocean; the portrait of the French writer François Mauriac is only contoured from semi-profile, only an almost-abstracted line appearing on the black background. The strong contrast between black and white and the use of this contrast to overcome classical portraits, is characteristic of all these portraits, thus creating a dramatic, enigmatic, mystical atmosphere, abundantly making use of the so-called "active black". Yousuf Karsh is considered to be one of the contemporary artists who adopt the low-key photographic style in the most efficient manner, being called "one of the 20th century's great portrait photographers" by Time magazine. Other noteworthy examples that deal with black hues photography include Paul Strand's Blind (1916), where the subject is deliberately shadowed in order to create the gloomy atmosphere of the image, and the "Blind" sign is lit; Ansel Adams's Mt. Moran, Teton National Park, natural light falls only on the peak of the mountain, while the rest of the photo is a mixture of dark grey tones; some of Edward Weston's photographs are also illustrative of the low-key style, such as Nautilus (1930), Pepper No. 30 (1930), Cabbage Leaf (1931); Brassaï's Filles de joie, Quartier Italie (1932); Bresson's Nehru Announces Gandhi's Death, (1948). In 1944, Robert Capa takes photos of Picasso in natural light that only highlights the right half of his face, leaving the left one in the shade. Irving Penn (1917–2009) took several low-key photographs of the American jazz trumpeter and composer Miles Davis. Among postmodernist photographers, the Australian Bill Henson photographs controversial nudes in low-key, Elad David works mainly with male nudes and in some of them only the busts – no head – of young men, is highlighted, leaving everything else in pitch black. Another artist who created a series of low-key photos exhibited in numerous exhibitions around the world, is the Finnish photographer Juha Arvid Helminen. He named his series The Invisible Empire, and refers to the shield that black colour offers, like a mask between who we truly are and the way society perceives us. Taking low-key photographs is possible in dark rooms where light penetrates only through a small window or a single unidirectional soft light, but the best results are achieved by using artificial studio lights. Sometimes, a single directed light source is sufficient. Usually, well-targeted sources are used to get the desired effect, since a large light source could considerably reduce the desired result. Special attention is paid to having sufficient neutral details that will, invariably, be left in the shade. This type of lighting is also known as Rembrandtian light. There are various technical challenges depending on the subject, what the photographer wants to highlight, or how many subjects are in the frame. Therefore, photographing a single person and, for instance, if the photographer wants to highlight only half of the subject's face, a single light source placed laterally, at a certain distance and angle to the subject, and possibly a blend, will be usually used. Experimenting with different light intensities is performed until the desired effect is achieved. For photographing two people or a static scene, two or even three sources of light (one or two for contour, and a very low-intensity fill light) are usually used. The background is kept dark (ideally, fully black), as well as part of the face that will remain in the shade. The relative power of the main and the fill lights, known as light ratio, can be measured using a light meter. The low-key technique has a higher light ratio, for example 8:1, while the high-key technique has a lower ratio, around 1:1. According to photographer Gavin Hoey "the first attention to detail has to be the background. It is best to keep it black or dark gray ... and from there, it is about improvising to achieve that perfect shot you have in mind" Lights Talking advises choosing and maintaining the lowest ISO (100, 64 or even 32) to get noise-free photographs. Unlike tattoo and other forms of body art, body painting is temporary, painted onto the human skin, and can last several hours or many weeks (in the case of mehndi or "henna tattoos" about two weeks). Painting the human body in black is also employed in low-key photography using non-toxic dyes or pigments in order to darken and enhance as much as possible the colour of the subjects photographed, and to achieve the desired effects. In order to achieve the effect of reflection of light that creates a white contour of the painted body, as well as a high contrast between black and white, various dyes mixed with body creams are used. These usually include henna, tempera or acrylic paint. Liquid latex, which is composed of natural latex and dyes, is also used with caution to avoid stopping the skin to breathe. Acrylic paint can be applied on the body with simple brushes or aerographs. This is one of the most used techniques because it dries very fast, provides elasticity and does not stain, since it is a water-soluble dye. Wikimedia Commons has media related to Low-key photography. ^ a b Owen, Robin (2014). Boudoir Lighting: Simple Techniques for Dramatic Photography. Amherst Media. pp. 50–53. ISBN 9781608957569. ^ a b Phillips, Norman (2004). Lighting techniques for low key portrait photography. Buffalo, N.Y.: Amherst Media. ISBN 978-1584281207. ^ Kamps, Haje J. (2012). The rules of photography, and when to break them. Lewes, East Sussex: Ilex. pp. 48–49. ISBN 978-1908150585. ^ Stoppee, Brian; Stoppee, Janet (2008). Stoppees' guide to photography and light: what digital photographers, illustrators, and creative professionals must know. Oxford: Focal. pp. 256–262. ISBN 978-0240810638. ^ Kindem, Gorham; Musburger, Robert B. (2004). Introduction to Media Production: The Path to Digital Media Production. Oxford: CRC Press. p. 245. ISBN 9781136053221. ^ Gillian McIver (23 March 2017). Art History for Filmmakers: The Art of Visual Storytelling. Bloomsbury Publishing. p. 41. ISBN 978-1-4742-4620-0. ^ Brett Abbott; Edward Weston (2005). Edward Weston: Photographs from the J. Paul Getty Museum. Getty Publications. p. 130. ISBN 978-0-89236-809-9. Retrieved 6 June 2018. [...] black face like that and a black background and pull it of in direct sunlight – and that is a challenge. ^ Grundberg, Andy. "PHOTOGRAPHY: A RETROSPECTIVE OF KARSH PORTRAITS". The New York Times. Retrieved 6 June 2018. In a typical Karsh photograph, the sitter's visage emerges from a black background so dense and velvety that it could be poured on a sundae. ^ "Online Etymology Dictionary". www.etymonline.com. Retrieved 29 August 2017. ^ "The definition of low-key". Dictionary.com. ^ "A Musical Definition". Genius of Liberty. 14 (42). 23 October 1830. Retrieved 29 August 2017. A gentleman, whose real name was George Sharp, but who generally went by the appellation, amongst his musical friends, of G sharp, on entering the company, and looking rather dull, a common friend observed that Mr. G. Sharp, was rather on a low key, that evening.—"O," replied a lady, with a good deal of naivette, "every body knows that G sharp is A flat." ^ a b Rice, Patrick (2006). Master guide for professional photographers. Buffalo, N.Y.: Amherst Media. p. 81. ISBN 978-1584281955. ^ a b Simmel, Georg (2005). Rembrandt: an essay in the philosophy of art. New York: Routledge. ISBN 9780415926690. ^ Kleiner, Fred S. (2009). Gardner's Art Through the Ages: A Global History (13th ed.). Australia: Thomson Wadsworth. p. 681. ISBN 9780495410584. ^ a b c Gombrich, E. H. (1995). The Story of Art (16th ed.). London: Phaidon. pp. 302–303. ISBN 978-0714832470. ^ a b c d Rzepinska, Maria; Malcharek, Krystyna (1986). "Tenebrism in Baroque Painting and Its Ideological Background". Artibus et Historiae. 7 (13). doi:10.2307/1483250. JSTOR 1483250. ^ Earls, Irene (1987). Renaissance Art: A Topical Dictionary (1st ed.). New York: Greenwood Press. p. 263. ISBN 9780313246586. ^ Anderson, Paul L. (2017). Pictorial Photography: Its Principles and Practice (Classic Reprint). Forgotten Books. ISBN 978-1331990680. ^ Hacking, Juliet, ed. (2012). Photography: The Whole Story. London: Thames & Hudson. pp. 172–173, 254, 269, 280, 282–283, . ISBN 978-0-500-29045-3. ^ Grange, Ashley (2005). Basic Critical Theory for Photographers (Reprint. ed.). Amsterdam: Focal. ISBN 9780240516523. ^ Flam, Jack (1995). Matisse on Art (Rev. ed.). Berkeley: University of California Press. p. 306. ISBN 0-520-20037-3. ^ Lawrence, William B. (1994). Painting Light and Shadow in Watercolor. Cincinnati, Ohio: North Lights Books. ISBN 9780891345770. ^ Wolf, Rachel R. (1998). Light and Shadow. Cincinnati, Ohio: North Light Books. ISBN 9780891349310. ^ Hall, Marcia (1994). Color and Meaning: Practice and Theory in Renaissance Painting. Cambridge University Press. ISBN 978-0-521-45733-0. ^ Dickerson, Madelynn (2013). The Handy Art History Answer Book. Canton, MI: Visible Ink Press. p. 113. ISBN 9781578594634. ^ Zolfagharifard, Ellie (19 August 2015). "Mystery of the Mona Lisa's smile solved: Second painting shows how da Vinci created an optical illusion to trick viewers". Daily Mail Online. Retrieved 30 August 2017. ^ "Glossary of the National Gallery, London". www.nationalgallery.org.uk. Retrieved 30 August 2017. ^ Kalderon, Mark E. (2015). Form without Matter: Empedocles and Aristotle on Color Perception. OUP Oxford. p. 102. ISBN 9780191027734. ^ The Prophecies and Revelations of Saint Bridget of Sweden. Altenmünster: Jazzybee Verlag. 2012. ISBN 9783849622541. ^ Langdon, Helen (1999). Caravaggio: A Life. London: Pimlico. ISBN 9780712665827. ^ Weller, Dennis P. (1998). Sinners and Saints. Darkness and Light. Caravaggio and his Dutch and Flemish Followers (1 ed.). Raleigh: North Carolina Museum of Art. pp. 25–36. ISBN 9780882599809. ^ Ortiz, Aurora R. (1976). Art: Perception and Appreciation. Goodwill Trading Co., Inc. pp. 86–87. ISBN 9789711109332. ^ Mariano, L. (1939). Masterpieces of Italian Art: Loaned by the Royal Italian Government and Exhibited at the Art Institute of Chicago. Art Institute of Chicago. ^ Connor, Alex (2014). The Caravaggio Conspiracy. Quercus Publishing. ISBN 9781743519707. ^ "Artibus Et Historiae". IRSA. University of Virginia: 93–101. 1986. ^ "The Listener". 57. BBC. 1957. ^ "Yousuf Karsh Facts". biography.yourdictionary.com. Retrieved 30 August 2017. ^ Hassan, Oskar H. (2015). International Colloquium of Art and Design Education Research (i-CADER 2014). Springer. pp. 168–170. ISBN 9789812873323. ^ "Yousuf Karsh". The Economist. 18 July 2002. ^ Crawford, Blair (14 May 2017). "The Capital Builders: How 'Karsh of Ottawa' captured the world's most famous people in photos". Ottawa Citizen. ^ Tippett, Maria (2007). Portrait in Light and Shadow: The Life of Yousuf Karsh. Toronto: Anansi. ISBN 9780887841989. ^ "The Greatest Portraits Ever Taken By Yousuf Karsh". 121clicks.com. 11 July 2012. Retrieved 30 August 2017. ^ Karsh, Yousuf (2012). Travis, Davis (ed.). Karsh: Beyond the Camera. Boston: David R. Godine Publisher. ISBN 9781567924381. ^ a b Langford, Michael J. (1982). The Master Guide to Photography. Knopf. p. 25,376. ^ Karsh, Yousuf; Travis, Davis (2009). Yousuf Karsh: Regarding Heroes. Boston: David R. Godine. p. 32. ISBN 9781567923599. ^ Heimendahl, Eckart (1974). Licht und Farbe: Ordnung und Funktion der Farbwelt (in German). Berlin: de Gruyter. p. 108. ISBN 9783110023794. ^ Mather, Philippe (2013). Stanley Kubrick at Look Magazine: Authorship and Genre in Photojournalism and Film. Bristol: Intellect. ISBN 9781841506111. ^ Jacobson, Louise (25 August 2016). "At the National Portrait Gallery, Intimate Jazz Portraits by Herman Leonard". Washington City Paper. Retrieved 29 August 2017. ^ Berman, Eliza (18 August 2015). "Yousuf Karsh's Masterful Portraits From Churchill to Hepburn". Time. Archived from the original on 3 January 2017. Retrieved 29 August 2017. ^ "Ansel Adams Photographs". National Archives. 15 August 2016. Retrieved 30 August 2017. ^ "Edward Weston's 'Cabbage', an Icon of Modernist Photography". www.beetlesandhuxley.com. Beetles & Huxley London. Retrieved 30 August 2017. ^ "Nehru announces Gandhi's death". Iconic Photos. 26 July 2009. Retrieved 30 August 2017. ^ MemyselfandI: Photo Portraits of Picasso, Kerstin (2011). MeandMeandMe The Faces of Picasso. Ostfildern: Museum Ludwig. ISBN 9783775731997. ^ Whelan, Richard (2004). Robert Capa: The Definitive Collection. London: Phaidon Press. ISBN 9780714844497. ^ Budhos, Marina; Aronson, Marc (2017). Eyes of the World: Robert Capa, Gerda Taro, and the Invention of Modern Photojournalism. Henry Holt and Company (BYR). ISBN 9781250109675. ^ a b "Israeli Lens". Lens Magazine. Israeli Art Market (7): 16–17, 50–51, 208–209. April 2015. Retrieved 30 August 2017. ^ "Bill Henson's photographic work seized from gallery by police". www.abc.net.au. 18 June 2012. Retrieved 30 August 2017. ^ Moakley, Paul. "Bill Henson and the Dark Matter of Portraiture". Time. Retrieved 30 August 2017. ^ Hunt, Nigel (18 September 2013). "Bill Henson pulls controversial exhibition at Art Gallery after call from detective to Jay Weatherill". The Advertiser. Retrieved 30 August 2017. ^ "Elad David – Lens Magazine". lensmagazine.net. Retrieved 30 August 2017. ^ "Juha Arvid Helminen's Photography Series "The Invisible Empire" Criticizes the Power of Uniforms". Hi-Fructose Magazine. 30 October 2014. Retrieved 30 August 2017. ^ "Juha Arvid Helminen". Georgie Magazine. 30 August 2015. Retrieved 30 August 2017. ^ "The Invisible Empire". juhaarvidhelminen.com. Retrieved 30 August 2017. ^ "The Invisible Empire by Juha Arvid Helminen – Surrealism Today". Surrealism Today. 9 October 2015. Retrieved 30 August 2017. ^ "The Invisible Empire". GUP Magazine. Retrieved 30 August 2017. ^ S., Vidhu. "How to take low key images in natural light?". shutterstoppers.com. Retrieved 30 August 2017. ^ Davis, Harold (2011). Creative Lighting Digital Photography Tips and Techniques. Hoboken: John Wiley & Sons. ISBN 9781118084014. ^ a b "How to Create Dark Moody Low-Key Portraits with Minimal Gear". Digital Photography School. 14 January 2015. Retrieved 30 August 2017. ^ "Low-Key Black & White Portrait Lighting – Digital Photo Pro". Digital Photo Pro. Retrieved 30 August 2017. ^ Stoppee, Brian; Stoppee, Janet (2012). Stoppees' Guide to Photography and Light: What Digital Photographers, Illustrators, and Creative Professionals Must Know. CRC Press. p. 52. ISBN 9781136100543. ^ Davis, Harold (2013). Creative portraits digital photography tips and techniques. Hoboken, N.J.: Wiley. ISBN 9781118076187. ^ Child, John (2013). Studio Photography: Essential Skills. Melbourne: CRC Press. p. 153. ISBN 9781136101748. ^ Ramesh, Amar (11 April 2018). "Shooting Low Key Portraits in Studio Space". Fstoppers. Retrieved 5 June 2018. ^ "Low-Key Photography for Beginners – Enter the Dark Side". www.lightstalking.com. 29 August 2011. Retrieved 5 June 2018. ^ Katherine A. Dettwyler (31 March 2011). Cultural Anthropology & Human Experience: The Feast of Life. Waveland Press. pp. 344–345. ISBN 978-1-4786-0853-0. Retrieved 6 June 2018. ^ a b Mitchell, Doug (2008). Body painting. Stillwater, Minn.: Wolfgang. ISBN 9781929133666. ^ Quesne, Suzanne Le (2005). The Complete Guide to Make-Up. London: Thomson Learning. pp. 16, 87, 131, 233, 249–252. ISBN 9781844801442. This page was last edited on 27 January 2019, at 05:05 (UTC).